I ran in to an issue using Exchange 2010 in a Hybrid setup. In this case, I am running a fully patched Exchange 2010 SP3 CU12 machine, and I ran the new Hybrid Configuration Wizard. This completed successfully, so I do have a working Hybrid setup and should be able to move mailboxes cross-prem and send and receive mail on both sides. 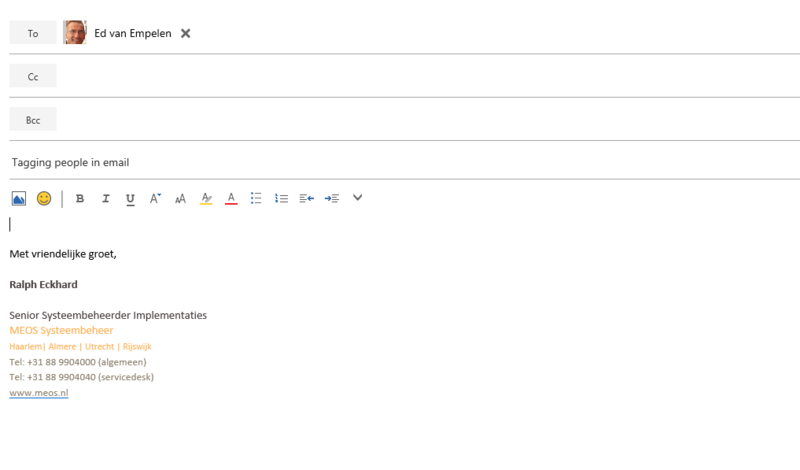 Next step is to add the Office 365 tenant to my Exchange Management Console. To do this, I right-click the ‘Microsoft Exchange’ tree and click the ‘add new forest’ link. After naming the forest and selecting the ‘Exchange Online’ option for the remote PowerShell instance, I need to enter the credentials for my tenant. When validating, the wizard throws an error. ‘The format of the Exchange object version is wrong. 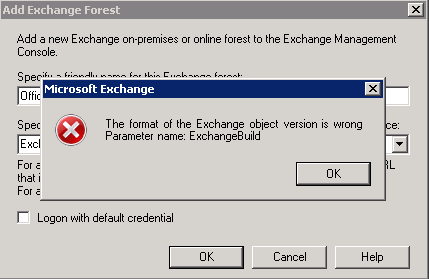 Parameter name: ExchangeBuild’. After some searching, I found other people running into the same problem. Some get the error when trying to open an existing instance in EMC, some get it when trying to create a new one, like me. For those who get the error on an existing instance, some users report that deleting and re-adding the instance solves the problem. Others can’t re-add the instance after deleting it, facing the same error as me. A MSFT employee responded in the thread, stating that the problem has been found and the Exchange team is working on resolving it. For now, there isn’t a resolution. The issue is also mentioned on support.microsoft.com, but aside from two obvious workarounds, there isn’t a solution yet. For creating the hybrid setup, you can use the new HCW without running in to the issue. For viewing properties for users that are homed on Exchange Online in your hybrid scenario, you can use the Exchange Online console online. However, for the time being, there isn’t a supported way to modify these properties in this scenario. Edit 3-9-2016: The issue seems to be resolved. The future is here! It was announced several times, but Microsoft finally upgraded the default available SharePoint Online storage for an Office 365 tenant to 1TB. This means that every tenant will get 1TB of pooled storage for SharePoint Online, increased with 500MB for each licensed user. That’s a big upgrade from the previous 10GB + 500MB. And the best part is that the increased storage is available directly! 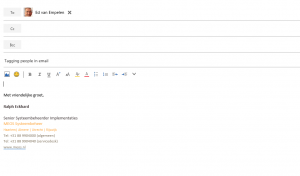 I think this is a huge improvement: it makes the Team Sites in SharePoint online a better candidate to store your shared documents, in stead of placing them on OneDrive for Business. And a team site is where those files belong, as OneDrive for Business is designed to be used just for personal files. The increase to 1TB will make that most businesses can start using SharePoint Online without the need for purchasing extra storage. Talking about OneDrive for Businesss: there is an update there to. Where the current storage limit for OneDrive for Business is 1TB per user, Microsoft is offering unlimited OneDrive for Business storage for premium plans. Other Office 365 plans will get 5TB for each user. The first fase of rolling these upgrades has finished recently. More information on these changes can be found in this announcement bij Microsoft. This sets the mailbox to a ‘regular’ shared mailbox instead of a room mailbox (what it was). After setting some access rights to the mailbox I emailed the customer that his mailbox was changed and that he could access it. After a few minutes, I received an email stating that he could send an email to the newly converted shared mailbox, but that the email would be moved to the trash can almost instantly. I know this is the default behavior for room mailbox where the calendar autoprocessing is enabled, so I reverted back to my Powershell window. This shows that the calendar processing for this mailbox is still active. Apparently, this doesn’t get disabled when converting a room mailbox to a different kind of mailbox. No problem, because we can use the set-calendarprocessing to disable this feature. AutomateProcessing can only be enabled on resource mailboxes. The error is clear: you can only run this command on a resource mailbox. The solution was also clear: convert the mailbox back to a room mailbox, remove the calendar processing and convert the mailbox to a regular shared mailbox again. Lessons learned: when converting a room mailbox with calendar processing enabled to a different type of mailbox, remove the calendar processing before converting the mailbox. 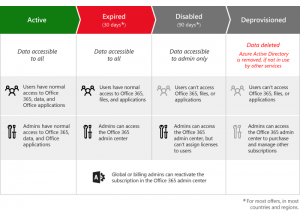 What happens when my Office 365 subscription ends? 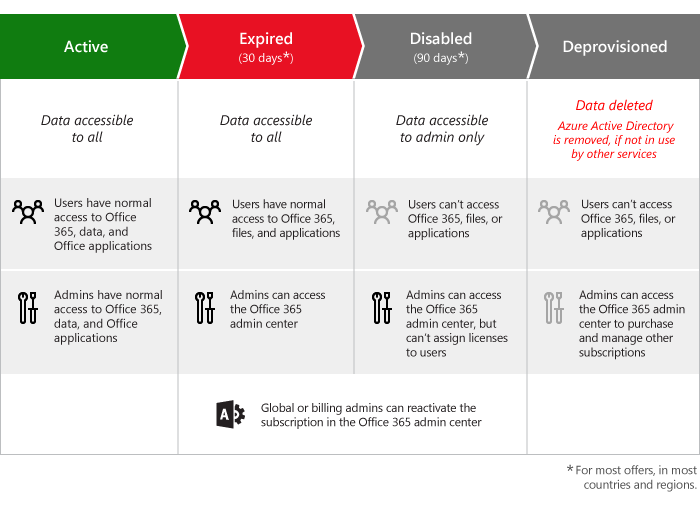 Your Office 365 subscription will end one day. Either because it expires, because payment wasn’t processed in time, or because you decided to cancel it. This doesn’t mean your data will be gone directly. There are several states before the subscription is fully deprovisioned. Microsoft has outlined the several steps of deprovisioning on their support pages. 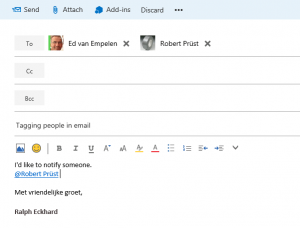 Office 365 E5 will bring PSTN calling to The Netherlands before this summer! Some breaking news at the Office 365 Drumbeat event today! 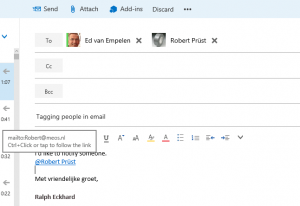 The Office 365 E5 plan has been available for a while, but in The Netherlands, there was no PSTN-calling. You can currently use the PSTN conferencing dial-in, but you can not use your Skype for Business as a cloud based PBX. This will change! Before this summer, PSTN-calling will be available in The Netherlands. This was disclosed at the O365 Drumbeat conference in Amsterdam today. Liking that? Then maybe this is a good moment to register for the Microsoft Cloud Roadshow, to be held in several cities. The one in The Netherlands will be held on May 19th and 20th in World Forum in The Hague. You can register online. So, you manage a nice, shiny Office 365 tenant. You use the portal to take care of your admin needs like creating users, assigning licenses and setting permissions. But you want more. Of course you want more, you’re in IT. You always want more. You no there is one tool that can give you more: Powershell. Like for al modern Microsoft workloads, PowerShell is my go-to tool for Office 365 too. 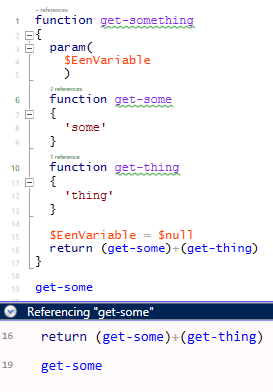 I find myself using PowerShell even for stuff I can do from within the portal, because i’m just simply used to it. 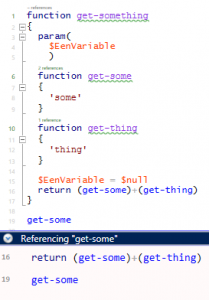 Some tasks you can only do in Powershell, so you need to learn it anyway. 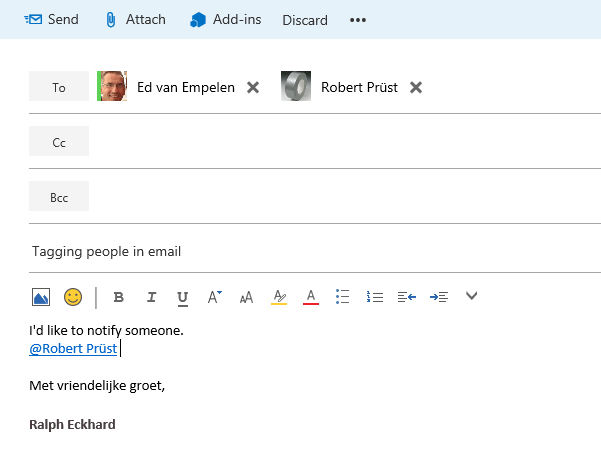 Back in the days, when Wave14 of Office 365 was still there, you needed Powershell to create a shared mailbox, for example. By now, you can do that from within the portal, but I still find myself using Powershell because i’m used to it. So, getting started with Powershell. How do you do that? For starters, Microsoft has a site dedicated to this. You can get started with the basic Powershell cmdlets for Office 365, find script examples and watch some Office Mechanics videos on the subject. Furthermore, when getting started with Powershell in general, the book Learn Windows Powershell in a month of lunches is a no-brainer. In, as the title says, a month of lunches you can get started using Powershell and get to know all tips and tricks. Because it starts from the basics, you get a solid foundation on the language so you can start building your own scripts and functions. One final tip, for when you’re ready to really get your Powershell going: invest in license for IseSteroids. This enhancement for the integrated script editor provides lots of functions to make your live easier. Really worth the money! 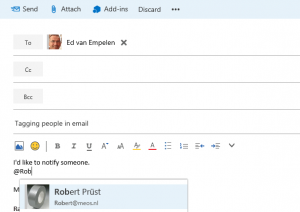 Use Outlook or Outlook for the Web? 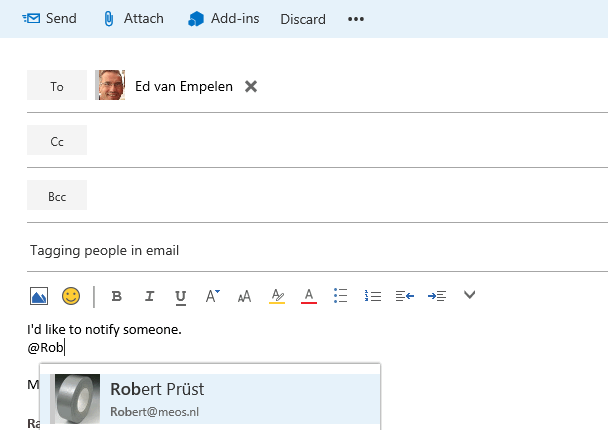 Just a quick blog post today, on deciding whether you should use Outlook for the Web for you tasks, or you should use the full Outlook desktop client. As it turns out, there is a complete topic on the Office support pages for this: you can find it here. There is a quick diagram on when you can use both clients, but also a detailed feature comparison to help you decide what you can use best. 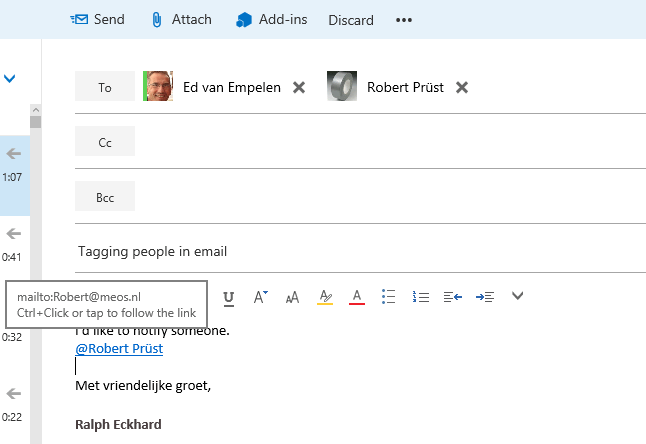 One of the previously announced features just showed up in our Office 365 tenant: tagging someone in an email. I start off by creating a new email. I address it to my manager and start typing. Somewhere along the line, I decide I want to include my colleague Robert in the conversation. I add him inline using the @-sign. Outlook for the Web picks this up, and displays some possible people I want to include. I click to select the right one. After I select Robert, he gets added in the to-field of the message. As you can see, the name becomes a clickable link to his email address. And that’s it! I really like this feature; it makes sure that when you add someone in an email with a ‘call to action’, the get added to the recipient list and you are sure they receive this email, even if they weren’t in the conversation before!